The Beechcraft Model 76 Duchess is an American twin-engined monoplane built by Beechcraft intended partly as a low cost introduction to twin-engine aircraft. 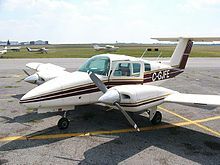 The Model 76 was designed as an economical twin-engine trainer for the Beech Aero Centers and to compete with the similar Gulfstream Cougar as well as the Cessna 310. The Duchess is an all-metal low-wing monoplane with retractable tricycle landing gear and a T-tail. It seats four. The Model 76 incorporates right and left "handed" Lycoming O-360 engines that turn in different directions to eliminate the critical engine during single engine operation. The Duchess wing is of aluminum honeycomb construction fastened by bonding, rather than rivets, to reduce cost and produce a smoother aerodynamic surface. The use of a T-tail on the Model 76 met with mixed critical reception when the aircraft was introduced. Plane & Pilot pronounced: "Outstanding design characteristics of the new Duchess include an aerodynamically advantageous T-tail, which places the horizontal surfaces above the propeller slipstream for better stability and handling. ", while Gerald Foster said: "[Beechcraft's] interest in T-tails was perhaps an affectation triggered by their wide use on jet airliners". 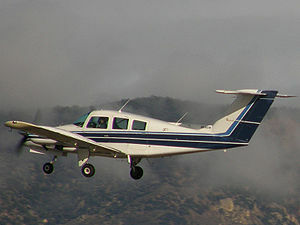 The later Piper Seminole also adopted a T-tail. Four-seat, twin-engine (Lycoming O-360), low-winged trainer with bonded aluminum construction. Unofficial designation for single test aircraft using turbocharged Lycoming O-360. The aircraft remains popular with flight training schools. Beechcraft - Tested one Duchess to investigate its spin recovery characteristics in conjunction with NASA. National Test Pilot School - Operates one Beechcraft Duchess. Purdue University - Uses a Duchess modified with air sampling equipment as Airborne Laboratory Atmospheric Research (ALAR). Scaled Composites - Uses one Duchess as a test aircraft. ^ Collins, Richard L. "What Happened to the Piston Twin?". Flying. Bonnier Corporation. Archived from the original on 7 Oct 2017. Retrieved 25 December 2018. ^ a b c McDaniel, William H. (1982). The History of Beech: Fifty Years of Excellence. Wichita, Kansas: McCormick-Armstrong Co. ISBN 0-911978-00-3. ^ a b c Phillips, Edward H. (1992). Beechcraft: Pursuit of Perfection (2nd ed.). Eagan, Minnesota: Flying Books. ISBN 0-911139-11-7. ^ "To provide increased final assembly facilities". Aviation Week & Space Technology: 15. 20 December 1976. ^ "Beech Plans to Close Plant at Liberal, Kan". Aviation Week & Space Technology: 27. 18 February 1985. ^ Phillips, Edward (8 June 2017). "The "Baby Beechcraft" - Part Two". KingAir Magazine. ^ Frawley, Gerard (2003). The International Directory of Civil Aircraft, 2003-2004. Fyshwick, ACT, Australia: Aerospace Publications Pty Ltd. p. 41. ISBN 1-875671-58-7. ^ Stowell, Rick (2007). The Light Airplane Pilot's Guide to Stall/spin Awareness: Featuring the PARE Spin Recovery Checklsit. Rich Stowell, Master CFI-A. p. 447. ISBN 9781879425439. ^ "Beech 76A Duchess". NTPS. Retrieved 25 December 2018. ^ "Army Instrumentation Facility: Airborne Laboratory Atmospheric Research (ALAR)". Purdue University. Archived from the original on 24 March 2018. Retrieved 25 December 2018. ^ "Rutan Voyager". Smithsonian: National Air and Space Museum. Retrieved 25 December 2018. ^ "Scaled Composites: SpaceShipOne" (PDF). National Aeronautics and Space Administration. p. 3. Retrieved 25 December 2018. ^ Taylor 1980, pp. 268–269.